With the growing foreclosure numbers and poor economic news coming out daily, Senator Harry Reid, introduced an amendment to Senate Bill 2636, which would allow a Bankruptcy court to modify the terms of a mortgage for a debtor’s primary residence. The Court would modify the terms of the loan when the debtor can not afford to make the current payments on their subprime or ARM loan. This would allow the debtor to keep their home and continue to pay for the home. As it stands today, bankruptcy courts can modify debt on vacation homes, cars, boats, and investment property, but not loans on a primary residence. This is a major contributing factor to the growing foreclosure crisis and it needs to be stop. It is against public policy to prevent a bankruptcy court from modifying a loan on the primary residence, but allow the bankruptcy court to make a boat loan more affordable. This is why in Florida a creditor who is not a mortgage holder and did not preform work on the home can not force you to sell your home to pay their debt. Many many people are hurting in today’s economy, some of the problems are self made, many more are beyond their control nor were the problems foreseeable. Regardless of how the situation came about the fact remains, people need help and your United States Senate has the ability to help resolve the problem to some extent. The major question now is what will the Senate do? Is the Senate bought and paid for by the mortgage company lobby, which opposes this bill, or are our Senators we send to Washington truly there to help hardworking Americas and do the “people’s work,” or is that just a sound bite? In the Pensacola area with housing values dropping daily, people who bought at the top of the market may find themselves owing more than what the house is worth. With this negative equity it is impossible to obtain new financing to lower payments or avoid the interest rate increase if they purchased their home with an ARM loan. I see people on a daily basis that are behind on their mortgage because of illness and being off work. Others are behind because they purchased their home with an ARM and the interest rate has increase the payments to where they can no longer afford the home. Giving the bankruptcy courts the ability to modify residential loans would greatly help the people of Pensacola get back on their feet and let the bankruptcy system fully help a debtor gain a fresh financial start. A foreclosure hurts the entire community. So I would caution those of you that say some one should lose their home if they spent more than they can afford, or ignore this call to action as you feel you will never be in this type of financial situation. When a house is foreclosed on in your neighborhood, and is sold at a rock bottom price it lowers the property values of all the homes in the neighborhood. So if your neighbor can prevent their home from being foreclosed on it not only helps them from becoming homeless it helps the entire community by not lowering the property values in the area. Plus, by allowing one to keep their primary residence it saves tax money in not having an increased homeless population to which the community must then deal with. This is a genuine crisis that threatens every community. Congress should take immediate and targeted action, I just hope they do so before it is to late. I would urge you to contact your Senators, and ask them to support Senate Bill 2636. Ask your Senator to make a true difference in the live’s of hardworking Americans who are down on their luck. Ask them to protect your home’s value by preventing people from losing their primary residence in foreclosure. Urge support of Senate Bill 2636, and particularly Title IV of the legislation. Below are links to web pages for Florida Senators Mel Martinez and Bill Nelson so you may contact them and them to support of Senate Bill 2636. Bankruptcy - Who files for it? Who files for Bankruptcy is a question I am asked many times each day. Many people have a misconception of the typical Debtor. Many have visions of people buying flat screen TVs, computers, taking lavish vacations and just generally have a grand old time and then skipping out on the bill. In fact, 99.9% of the people I see in my office each day are exactly the opposite. They are using their credit cards for food, utilities and even mortgage payments. Many if not all of them are people just down on their luck to put it mildly. Most have either lost their job, had a major medical problem not covered by insurance or recently divorced. Then there are some that have a combination of the three above mentioned problems. Many of who I see felt their situation was short term. They used their credit cards for basic needs and thought it was only going to be a month or two. The house of cards falls apart when the month or two passes and their situation has not improved and the cards are maxed out. These are the people I see everyday, hard working Americas down on their luck doing whatever they can to meet their family’s basic needs. Most of the people I see have spent many agonizing years, trying to pay back their debt. Many have already paid back what they originally borrowed and are now just paying late fees, over the limit fees, interest and whatever other fees the credit card company can come up with. Many want to pay their debt back, but the credit card companies will not work with them. Most Debtors do not understand why the credit card company will not work with them on a payment plan, lower the interest rate or stop charging fees. That is one question I do not have the answer for. One would think that something is better than nothing which is exactly what the credit card company is going to get if a Bankruptcy is filed. I do not pretend to understand or try to figure out why a credit card company does anything. The decision to file Bankruptcy is a very hard personal decision that many struggle with, sometimes for years. By the time most make the decision to actually go forward with a Bankruptcy filing and hire an attorney for said filing, it is way past time for them to file. Many should have filed a year two before hand. By filing when the first signs of financial troubles started popping up would have put them well on their way to recovery. It would have saved a year or two of harassing phone calls from creditors. It would have also saved them money. For example in that making just the minimum payment on a $1,000 credit card balance, with an interest rate of 17%, would take 12 years to payoff. Plus, you would be paying $979.00 in interest over those 12 years. My advice is when financial problems start popping up do not ignore them. Explore all your options, do not stick your head in the sand, take control and try to be proactive by heading off your financial troubles. Talk to professionals that can give you advice and guidance, many do not charge a fee to for a consultation. Florida is second to Nevada in foreclosures. While many are trying to sell their homes before being foreclosed on it seems many others could not avoid foreclosure. 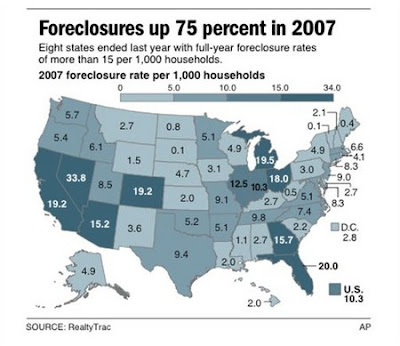 The picture below from AP shows state by state foreclosure rates. It paints a gloomy picture for what is to come for many Americans who can not afford the homes they live in or for investors who thought they could make some money flipping a house but today can not give away a house. I have seen many people in my office just wanting to get rid of their homes. They owe way more than what the home is currently worth and they can not afford the monthly payment with interest rates resetting and insurance and tax increases. So instead of trying to come current on the home by filing a Chapter 13 Bankruptcy they are wanting to give the home back in a Chapter 7 Bankruptcy. I offer a free consultation to see what is right for your situation. Please call my office at 850-607-2222. My fees start at just $675.00 plus filing fees and costs. I have notice a correlation over the last few years. It seems when gas prices spike so do calls to my office for Bankruptcy consultations. It is awful that people are living that close from pay check to pay check, but these are today's realities. Thankfully, over the last week or so it seems like gas prices have been on the decline. It has not been a huge decline but at least for now gas is under $2.90 a gallon. However, I have been reading articles predicting gas prices to be around $3.50 to $3.75 a gallon this summer. Hopefully, these predictions do not come true. While I do not think an increase in gas prices even to the $3.50 plus level alone will push most households into Bankruptcy. What could push households into Bankruptcy is when food, clothes and other basic needs increase in price due to increases in delivery costs this may force people into Bankruptcy. If you are living paycheck to paycheck, and are seeing an increase in necessary expenses that are increasingly getting harder and harder to make, Bankruptcy maybe a solution to your problems. I offer a free consultation to discuss your financial situation and my fees start at $675.00 plus filing fees and cost. Feel free to contact my office at 850-607-2222 to setup your free consultation. Thank you for looking at my profile. 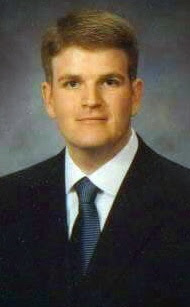 I am a Bankruptcy Attorney and have offices in Mobile, Pensacola & Fort Walton Beach. I help relieve the financial problems of hard working Americans, by helping them discharge their debt in Bankruptcy. Most people file Bankruptcy because they lost their job, had a major medical problem not covered by insurance or have recently been divorce. For the most part, this is a very hard decision and is not something that people do easily. For many, once they finally make the decision to file they have already paid back what they originally borrowed. With the Bankruptcy Reform in 2005, it made filing for Bankruptcy a mind numbing complex task, I would encourage you to seek the advice of an attorney who handles many Bankruptcies and is knowledgeable on the subject. I offer a free consultation and payments. My fees start at $675.00 for Bankruptcy plus filing fees and costs. My office is located at 113 N. Palafox Street, Pensacola, Florida 32502 and my office number 850-607-2222. Please call my office today to setup a free consultation. With the Bankruptcy Reform of 2005 my office was designated as a Debt Relief Agency. I help people file for Bankruptcy under the Bankruptcy Code.